It may sound funny, but blogging has helped improve my eating habits! 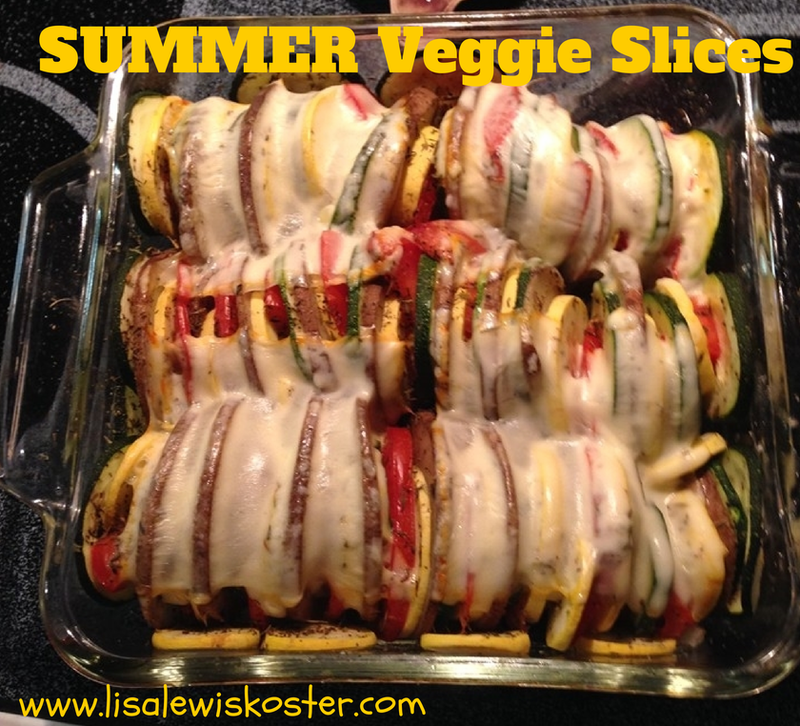 When I link up my blog posts, I visit others who have also linked up, allowing me to find great healthy recipes like this one for Summer Veggie Slices from W.O.W. (Warm Over Wednesday). Not only does it taste great, it also looks great, making it an ideal side dish on those nights when you have guests for dinner. Best of all, it's easy! The only drawback I found with this recipe is that it took forever for the potatoes to get tender. Total baking time was suggested to be 45-50 minutes. Mine was in for 1 1/2 hours and the potatoes still weren't as tender as I liked, although the original baking time was fine for the other veggies. I spoke with a few other people who had tried this dish and they had the same problem. My (untried) solution is to put the potatoes in the oven first, while you're preparing the other veggies, to give them a head start. Thinly slice the potato. 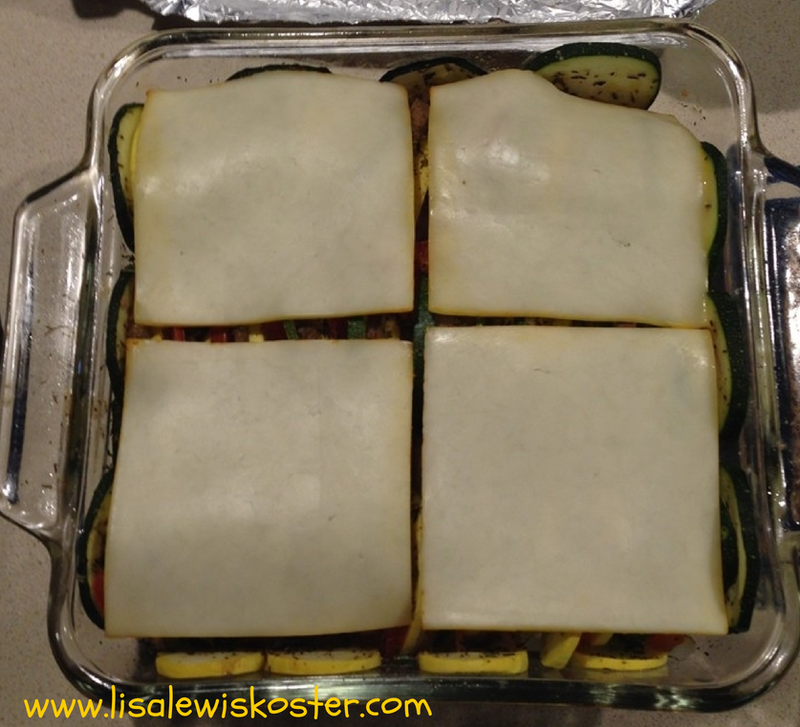 Layer it flat in the baking pan and place in the warming oven. Finely dice the onion and mince the garlic if you're using cloves. Spray a skillet with olive oil and saute the garlic and onions about 5 minutes, or until softened. Thinly slice the remaining vegetables. Remove pan with potatoes from the oven and temporarily place the potatoes on a cutting board or in a bowl. Sprinkle with salt, pepper and thyme. Cover the dish with foil and bake 30 minutes. 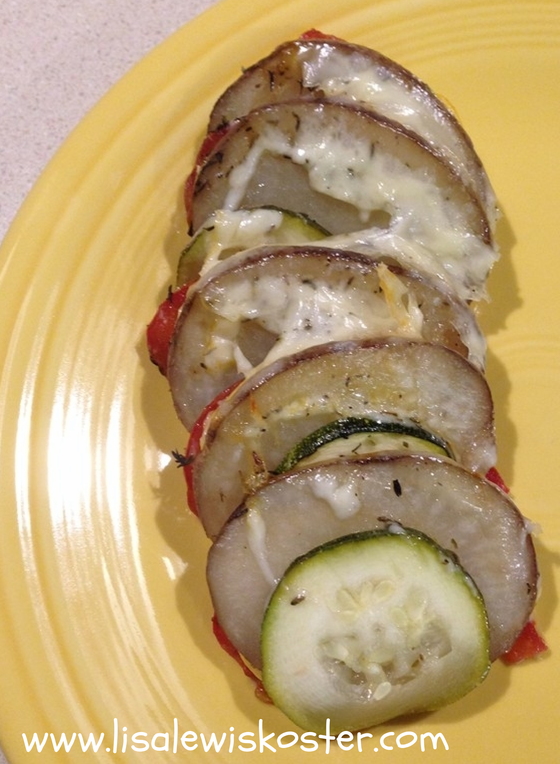 Remove the foil and lay the cheese slices over the veggies. The original recipe called for shredded cheese, but I prefer the slices because I think they give more even coverage. Return to the oven and bake another 15-20 minutes, or until the veggies are tender. Do you think giving the potatoes a head start will help, or do you have another suggestion? I'd love to hear your thoughts. 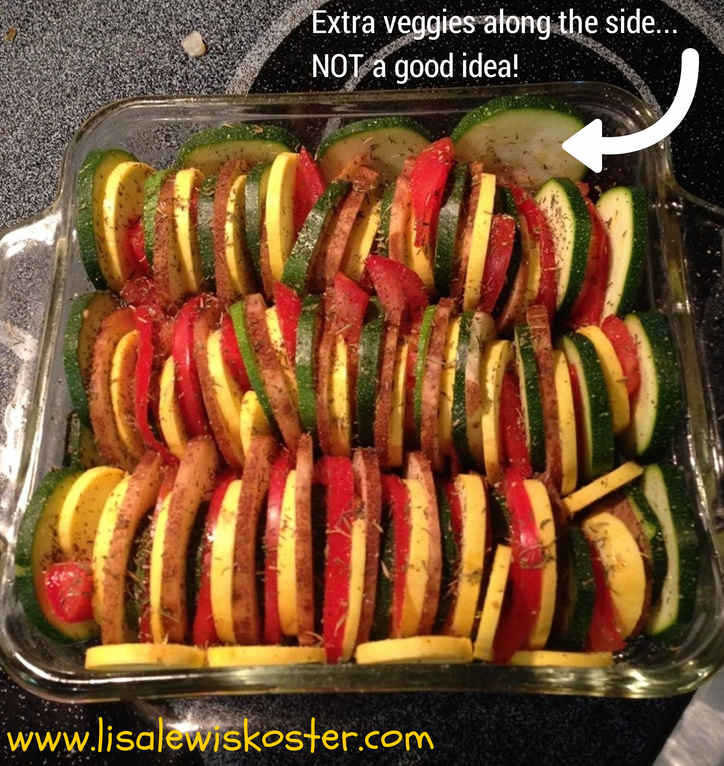 This is a great way to present vegetables as a dish. I can understand about the potatoes. They always take longer (like carrots) than "softer" veggies. Another way you could get them done at the same time is to boil the potato slices in water for a couple of minutes before adding them. Thanks for linking on my weekend blog hop! I would leave the potatoes out. I consider them more a winter veg anyway - a bit heavy for summer.